Extra Protection Running socks are made using the patented Blister Guard® system. This system incorporates Friction Free® Profilen® fibers throughout throughout the entire bottom foot and toe areas of the sock. Profilen’s chemical name is Polytetrafluoroethylene (PTFE). PTFE has the lowest Coefficient of Friction of any solid material. Extra Protection Running socks are a FDA Class 1 Medical Device. Drymax Extra Protection Running socks were designed to prevent blisters during triathlons, marathons and ultra-long distance runs. In addition, they will help people who are just prone to getting blisters. Extra Protection Running socks are made using the patented Blister Guard® system. This system incorporates Friction Free® Profilen® fibers throughout the entire foot area of the sock. Profilen’s chemical name is Polytetrafluoroethylene (PTFE). PTFE has the lowest Coefficient of Friction of any solid material. Profilen and Drymax fibers blended together provide Extra Protection for your feet. 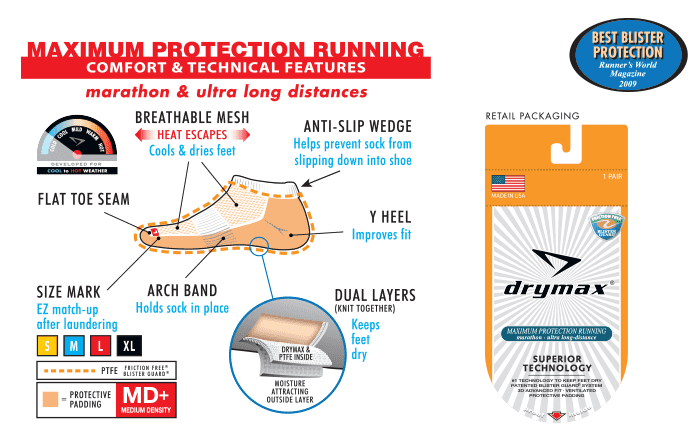 This scientific approach keeps feet dry and the friction between the skin and sock low. Runners who wear Extra Protection Running socks will have cooler, drier, more comfortable feet, while significantly lowering the chance of getting blisters. You will also have cooler and drier feet while wearing the Extra Protection Running Socks because they possess top mesh air panels which release heat and sweat vapor out of the top of the sock and shoe.